Probably the best known stop on our modern bus tour of Oklahoma City is actually on the outskirts of Norman. 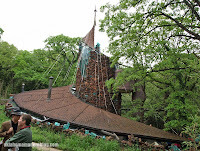 The bizarre abode known as the Bavinger House is nestled beside a two-lane strip of asphalt and hidden amongst blackjack trees and tall bamboo. While writing this fifth and final installment for On the Trail of Julius Shulman we received sad news of Shulman's passing at the age of 98. While there were many remembrances published in the following days, one I found insightful was from the blog of retailer Design Within Reach. Shulman worked with DWR over the years on various projects and promotions. Their blog was titled simply, Remembering Julius Shulman.The house juts up from the surrounding flora like an abandoned UFO. The brown roof blends in with the surrounding vegetation- yet its thin, steel supports (pilfered long ago from the cabane struts of a local aircraft manufacturer) glint in the sunlight. To call it unorthodox would almost be laughable- "other worldly" might be more like it! Bruce Goff may have designed this unique structure, and today gets most of the credit, but it was Eugene Bavinger who built it over the course of five years. Many of the components were either dug from the nearby farmland or re-purposed from local sources. The fact it's still standing is a testament to Bavinger's ingenuity. The roof and walls spiral upward, supported in the center by that most Okie of building materials: the oil well drill pipe. The roof is supported from above and does not rest on the spiral wall. Stone and glass make up this wall, that would stretch over 90 feet if laid straight. The house has a fairytale quality with a little Jules Verne mixed in. Jackie thought we might have been trapped in the game Myst. On this rainy day the adjacent creek was moving swiftly. The bright green grass along its banks was smoothed over as evidence of the heavy rains earlier that morning. Stepping inside it became quite evident the rain wasn't restricted to just the out of doors. An indoor water feature appeared to have benefited from the rains, as they leaked past the rock and glass walls. One tour goer likened living in the house to"indoor camping." Inside the house has a maritime quality with roped and wires supporting stairways and "living pods." The house has no rooms, as such. Saucer-shaped bowls were intended as bedrooms and living areas. Fiberglass cylinders, visible from outside, serve as closets. The kitchen is relatively mundane- being located on the ground floor and having a conventional wall. But don't take my word for it... take your own tour! Visit www.bavingerhouse.org for a gallery, special events, tour dates and times. In the 1960s & early 70s there was a very "Goff-like" structure on Oklahoma Hiway 10 Northeast of Grove Oklahoma. It had a cable suspended roof, stone walls and the famous glass cullet scattered on the sloping flat roof. It was clearly a design related to B. Goff, either of his design or "inspiration." If anyone knows of this structure please contact us at "The Architecture of Bruce Goff" in Facebook groups. Thanks for your help. That sounds familiar. My father is from Wyandotte so we visited the area quite often around that time. I'll try to do a little research. And here's a link to the Bruce Goff Facebook group.